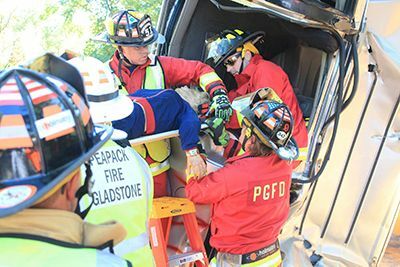 The Peapack and Gladstone Volunteer Fire Company has been serving the community since 1905. In addition to monthly business meetings, the company conducts monthly drills to maintain skills in fire fighting. Community services provided include 24 hour fire protection and a variety of projects such as the annual Easter Egg Hunt, Memorial Day services, Boy Scout activities and Fire Prevention Week events in October. During Fire Prevention Week, an open house is held at the Firehouse with films, literature and fire engine tours. The Peapack and Gladstone Fire Company also sponsors a Junior Firemen's Auxiliary. Young residents of the Borough ages 16-18 may join and learn the ropes of becoming a regular member. Applications can be obtained from any Fire Company member. © 2019 Peapack & Gladstone Fire Department • 6 Dewey Avenue Gladstone, NJ 07934 • Designed and maintained by RJR Solutions, Inc. All rights reserved.